I’m typically pretty one-in one-out with my skincare stash, but because all I want my cleanser to do is remove makeup and/or clean my face, I don’t mind having a few extras to choose from in my routine. 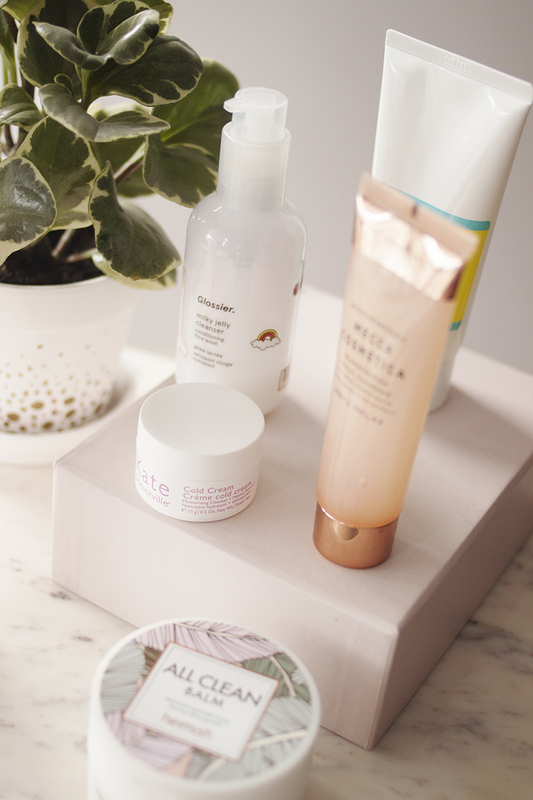 Because a cleanser is on your face for such a short amount of time, I don’t really rely on my cleansers for any “active” ingredients, so I don’t see the harm in having a few different options available if it’s within your budget. 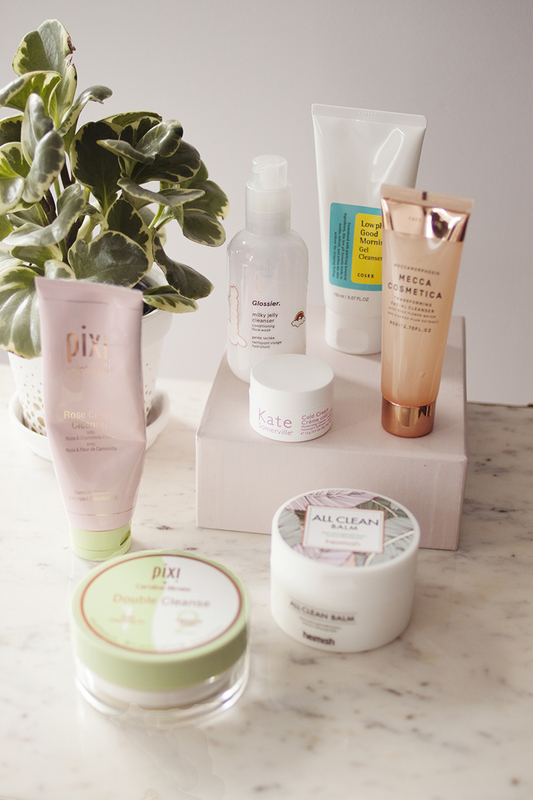 I’ve currently got more cleansers in rotation than I’ve had for a really long time, which is largely because a few of them are on their last legs, and I figured for the sake of this post I might as well try out my newer ones a little early so I could review them. 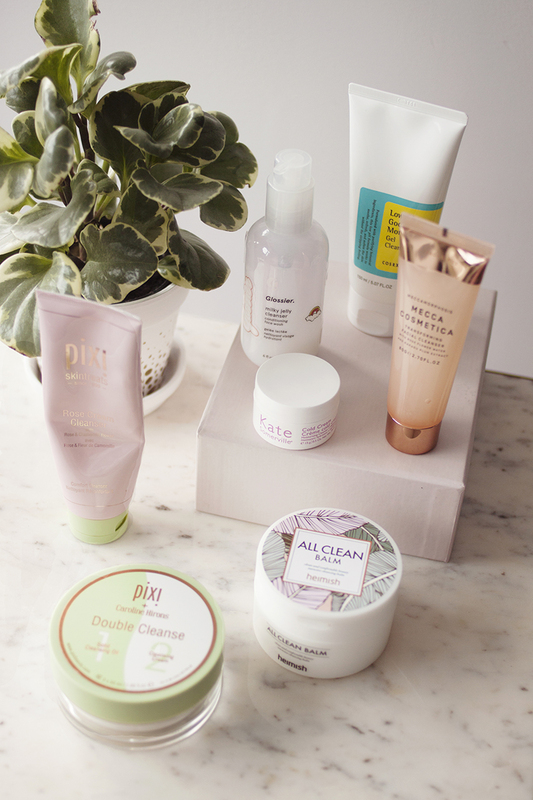 So it seemed like a good time to round up all the cleansers I’m currently using and give you guys my thoughts on them. I tend to group cleansers into two categories – makeup removing or face cleaning cleansers. I’ll generally use the face cleaning ones in the mornings or as a second step at night after I’ve removed my makeup, so that’s how I’ve split things up in this post. I always double cleanse at night because I want to make sure I’ve removed all the makeup and SPF I applied that morning. Not only does it minimise the risk of breakouts, but having properly clean skin means that whatever you apply next will be able to penetrate better. After applying my makeup removing cleanser, I always take everything off with warm water and a washcloth. I find it to be the most effect method, and I also really enjoy the experience and find it therapeutic. Even if it’s super late and I’m dreading having to stand at the sink, once I’m actually in the swing of things I always take my time and do it properly and I feel so much better afterwards. I’ve tried cleansing milks and I’ve never found them to be very effective, and while I enjoy oils they can be on the messy side, so balms come out on top for me. I recently finished up the Clinique Take The Day Off Cleansing Balm (AU) which I absolutely adore and have reviewed in the past, so I won’t dwell on it for long, but it’s a great reference point for some of the other cleansers I’m going to talk about, so it’s worth a mention. The next makeup removing cleanser is the All Clean Balm (AU) from Korean brand Heimish. I don’t typically buy Korean skincare because it can be hard to find information in English, and I generally won’t buy skincare if I can’t have a read through the ingredients list first. The lack of information makes the whole thing feel a bit overwhelming for me so I’m not always tempted to go through with a purchase. But after hearing about a different product from this brand (that I bought and will talk about at a later date), this one also caught my eye. I bought it from Mikaela Beauty which is a website that not only lists all the product ingredients, but is also based in Canada! The fact that I didn’t have to deal with import duties was a big plus, and my experience shopping with them was great. If you’re not based in Canada, Heimish is also available on iHerb, who ship globally. The All Clean Balm is very similar to the ones from Clinique & Pixi, it’s a clear, solid balm that melts on contact with the face and completely breaks down your makeup. It washes off clean with a washcloth and warm water, and doesn’t sting my eyes or leave a residue. The only major difference (except that it’s even softer to the touch than the Pixi) is that this contains a variety of fragrant plant oils, which means it does have a scent. It’s not artificial or added to the product as “fragrance”, and personally fragranced skincare isn’t a make or break issue for me anyway, so I’m perfectly happy with this product, but if you have particularly sensitive skin I’d probably give this one a miss. On a more superficial level, the packaging is really cute. It has a flip top lid and underneath that is a plastic tray covering the product, with a small spatula resting on it that you use to dig out the balm. I never gave much thought to the whole spatula situation before, but now that I’ve tried it I LOVE it. It really is the little things, huh? It’s also more affordable than the likes of the Clinique, coming in at around $25 for 120ml! In case it’s not obvious from the name, the Pixi Double Cleanse (AU) is two cleansers in one – a makeup removing balm and face cleaning cream. The balm side is so similar to the Clinique balm it would be hard to tell the difference in a blind test, but if you pushed me I’d say the Pixi one is slightly softer in the pot. Both the balm and cream are unscented and don’t sting the eyes, which is always something I look out for. The balm side makes short work of makeup and SPF, and with the help of a washcloth it’s easy to remove and doesn’t leave any residue behind. The cream side has a very standard cream texture that does exactly what you’d expect it to – it’s not for removing makeup but it will gently remove any last traces of whatever may be left without stripping the skin. I think this product would suit any skin type, but especially if you have sensitive skin you’d be pretty safe with this. However, the 2-in-1 aspect is both a blessing and a curse. If you’re new to the double cleanse method, this would be perfect for you as you’d only have to buy one product, and it would be great for people who frequently stay between two places. If you travel between your parents’ homes, or between yours and your partner’s this would be perfect to leave at your second place and call it a day. The main downside in my eyes is the packaging as it’s quite bulky so it’s not great for travel, and you would have to buy a second cleanser for the mornings or else you’d run through the cream side a lot quicker than the balm. I do love both of the cleansers though, and sometimes it’s nice not to have to faff around with lids and pumps while holding a wet washcloth, having everything in the one container is very convenient. However, because it’s split in two you only get 50ml of each product so if you’re using this exclusively you’ll probably get through it pretty fast. If they sold both of these products in separate packaging I’d definitely buy them though as they’re foolproof and get the job done with ease. The final makeup removing cleanser I’m going to talk about is the Kate Somerville Cold Cream (AU) which I got as a gift with purchase from Sephora. The term “cold cream” does initially make me think of what women would use in years gone by, but obviously this is an updated formula. Although this is a white cream, in texture it’s kind of a balm/cream hybrid, and it is intended for removing your makeup rather than cleaning your face. I personally find the texture a bit waxy feeling, and I just prefer the experience of using a balm that melts down, which this doesn’t really do. I feel like it’s not quite as effective at removing my mascara as the other products I’ve been using, and although this does work I’m just a balm-lover through and through so I don’t feel the need to buy this after trying it out. Moving on to the face-cleaning cleansers, these are great for getting rid of any last traces that might still be hanging around from my makeup removing cleanse, as well as actually cleaning my face. I always use something like this (or sometimes a micellar water) in the mornings just to remove any sweat, oil or dirt that may have accumulated overnight. As mentioned, I’m currently using the cream side of the Pixi Double Cleanse, and although this is a pretty basic cream cleanser, I personally have a soft spot for a something simple like this. It may not be particularly exciting or luxurious, but it definitely gets the job done and there are no negatives to speak of. It’s very mild, unscented and non-foaming, so it doesn’t strip the skin or dry it out, and just about anyone could use it. Another cleanser I’ve been using from Pixi is the Rose Cream Cleanser (AU), which is actually a clay/cream cleanser, which I didn’t expect from the name (should’ve looked at the ingredients more closely, lol). I don’t mind a clay cleanser, but I do find that they always smell the same and I don’t particularly enjoy that scent, which is really the only downside of this product for me. I’m coming close to the end of this cleanser, and it has served me well but I do prefer the cream from the Double Cleanse over this, but that’s just personal preference and has nothing to do with performance. If you like the sound of a clay cleanser this is one of the more affordable ones around and it’s a really nice product. A classic cleanser that I’ve spoken about many times before is the Glossier Milky Jelly Cleanser. This has a beautiful balm-gel texture that doesn’t foam up and is really gentle. The brand says you can use it to remove makeup, but I don’t personally find it as effective as a balm, so I stick to using this in the mornings or as a second cleanse in the evenings. I’ve talked about my love for this enough times in the past that we don’t need to dwell on it for too long, but it’s a staple for me and I’ve already repurchased it. The main downside of the Glossier cleanser is that they only ship to a handful of countries, but if you’re based in Australia or New Zealand I have good news for you. My mum recently brought over a tube of the Mecca Transforming Facial Cleanser for me to try, and told me at least 60 times how much she loves it, and that my dad even uses it too. 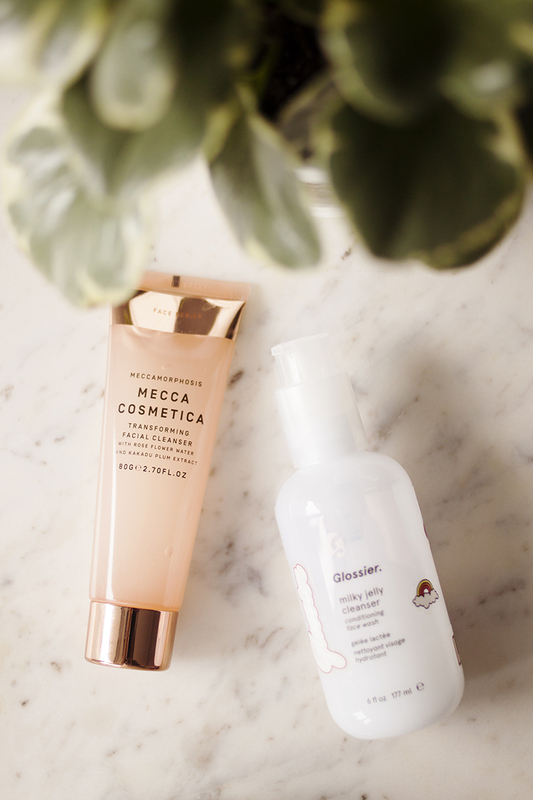 As soon as I tried this I was instantly reminded of the Glossier cleanser – this is definitely the closest thing I’ve ever tried texture-wise, so if you can’t get your hands on Glossier, definitely give this one a try. I think this is a little more effective at removing makeup, but I still prefer it as a second cleanse because that’s just how I like to do things (maybe I’m stuck in my ways, but it works for me!). It contains kakadu plum extract which gives it a light fruity scent, but other than that it’s super similar to MJC – doesn’t sting the eyes, very gentle, non-foaming, non-drying, etc. Ultimately it’s a really beautiful product with probably the most beautiful packaging out of anything in this post, and I’ll definitely continue using it in the future. Last up we have the COSRX Low pH Good Morning Gel Cleanser (AU) which I threw in my basket when I picked up those Heimish products because I’ve heard a few people talking about this and frankly I wanted to make the free shipping minimum. This is definitely the closest thing to a foaming gel cleanser that I’m comfortable with, although this produces a slight, creamy lather rather than a serious foam (at least in the way I use it). I’m not fanatical about the pH of my products, but ultimately the main issue I have with foaming cleansers is their pH. Anything above 7 is considered alkaline, so using a cleanser with a higher pH can disrupt the skin’s delicate acid mantle, which naturally sits between 4.5-5.5. Ideally our cleansers will be formulated with a pH in or close to that range so as not to strip or dry out our skin. The COSRX cleanser has a pH of 5, although the pH of products changes when they’re combined with water. I personally find this a little stronger than using a cream cleanser (my fave) and if you have particularly dry or easily-irritated skin I would probably stick with a cream over something that foams at all. I am comforted by the pH level, although I do find this to leave my skin feeling slightly drier after using it than with my other cleansers. It’s not a horrible, tight feeling, but it is noticeable. However, it doesn’t sting my eyes which is something I always avoid. It has a slight tea tree scent to it due to the inclusion of tea tree oil, which can be good for acne. Although I probably won’t repurchase this just because of my personal preference, I’ll still go ahead and use it up.